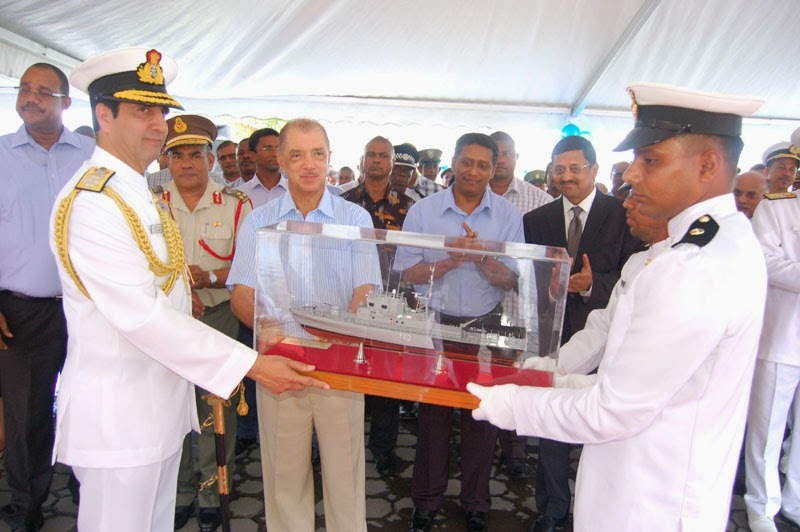 The Chief of Naval Staff, Admiral R.K. Dhowan presenting a model of INS Tarasa to the President of the Republic of Seychelles, Mr. James Alix Michel, in Seychelles on November 07, 2014. The Chief of Naval Staff, Admiral R.K. Dhowan addressing the gathering at a function, in Seychelles on November 07, 2014. In a ceremony that was both poignant and celebratory, INS Tarasa was formally transferred from the Indian Navy to the Seychelles Coast Guard on Friday , 07 Nov 14, to assume a new life as patrol ship Constant. Presided over by Mr. James Alix Michel, the President of the Republic of Seychelles as also Commander–in-Chief of the Seychelles People’s Defence Forces and the nations’ Defence Minister, the ceremony was attended by a host of top ranking officers of the Seychelles government, including the Vice President of the nation, the Foreign Minister, the Home Minister, the Chief of the Defence Forces and Chief of the Seychelles Coast Guard. The Indian side was represented by Admiral RK Dhowan, Chief of the Naval Staff, who flew in particularly for this event, His Excellency Mr. Sanjay Panda, High Commissioner of India to Seychelles and Rear Admiral R Hari Kumar, Flag Officer Commanding Western Fleet. Three frontline ships of the Western Fleet were also present in harbour to participate in this historic event. Speaking on the occasion, Admiral Dhowan pointed out that the ‘waters of the Indian Ocean wash the shores of the two nations, not only making them maritime neighbours, but also bonding them closely in a relationship of deep and traditional economic ,social and cultural links’. He went on to highlight the importance of the seas to the economic prosperity of both nations in the 21st century and the need to ensure maritime security in the Indian Ocean in the face of growing asymmetric and non conventional threats, so that both nations could grow and prosper unhindered. Admiral Dhowan stated that the transfer of INS Tarasa to the Seychelles Coast Guard would strengthen the bilateral relationship between the two forces further, and bring the two nations even closer. Echoing Admiral Dhowan’s remarks, the President of Seychelles, Mr James Alix Michel, stated that the seas unite India and Seychelles and that Seychelles remained thankful for the assistance and help it received from India in enhancing its capacity and capabilities to counter threats to Seychelles in the maritime domain. Thanking Admiral Dhowan and ships of the Western Fleet for their presence on this momentous occasion, he stated that PS Constant will remain a standing reminder of the friendship and trust between the two nations, their common interest in keeping the global commons safe and in expanding their blue economies, and the need for nations to cooperate in establishing maritime security in the 21st century..
INS Tarasa (re-christened PS Constant) is the second fast Attack Craft to be gifted by the Government of India to Seychelles in the recent times, the previous being INS Tarmugli that was renamed PS Topaz. PS Constant and PS Topaz along with the Dornier Maritime Patrol aircraft (also gifted by Government of India) are expected to operate together in the coming years, forming the core of the Seychelles Coast Guard’s ability to keep the EEZ of the nation safe and secure from burgeoning maritime threats. 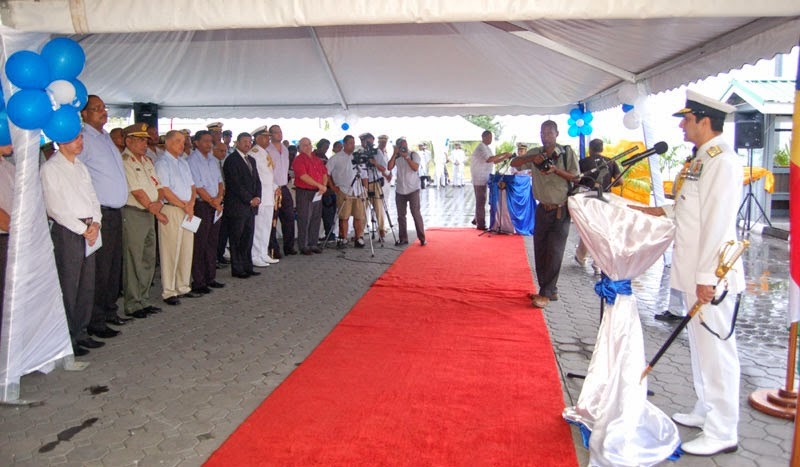 The transfer ceremony was a spectacular event, attended by numerous dignitaries of the Seychelles Government and society and widely reported by the Seychelles media. To commemorate the occasion, a reception was hosted on Western Fleet ships by Adm Dhowan and HE Mr Sanjay Panda and attended by a huge number of high ranking officers of the Government of Seychelles, as well as host of citizens of the island nation.